Here’s another glorious #wonderword! One you might be forgiven for thinking was the name of a villain in a James Bond film but in fact dégringolade is used either as a verb or a noun to describe a more serious state of affairs – that of a decline or deterioration. Not just any old type of decline but a rapid one. 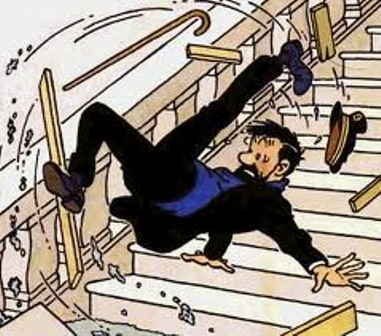 One minute up, next minute down, just like Captain Haddock of Tintin fame whose life is a series of disasters interspersed with acts of comedic heroism. It also brings to mind yesterday’s inglorious tumble in political clout and prestige of the British Prime Minister, Theresa May. A prime case of semantic drift dégringolade’s etymological origins are Middle French (desgringueler) meaning to tumble and also Middle Dutch (crinkelen) to make curl, similar in fact to the English words of “crinkle” and “crank”. In other words dégringolade indicates not only decline but its speed and trajectory. Got it? Either way it is a fantastically expressive and imaginative word to be savoured. ¹ Winters, P. M., “Democratic Party Dégringolade”, Dignitas News Service, 6 November 2014. ² Barnes, J, Nothing to be Frightened of, (Jonathan Cape), 2008. For a review of this book written in the New York Times by Garson Keillor click here. For the pronounciation of dégringolade click here.